Meander through 1819 India with Firangia as he covers villages, jungles and small towns while on a journey of romance, devotion, crime and deception. But there is someone always watching over. This is pre-railways India, when merchants travel in caravans, noblemen with escorts, and no road is secure. On his way home after a trade expedition, Firangia’s path is crossed by the beautiful Chanda Bai, travelling with a small party of guards. Through a warrior, she wishes to travel under his protection. Should he decline? Read about grandiose ambitions pitted against petty schemes, love and deceit, and what in our modern times is termed ‘evil’. You will find in this intellectually ambitious, meticulously researched, action-packed historical fiction a broader, age-independent significance. 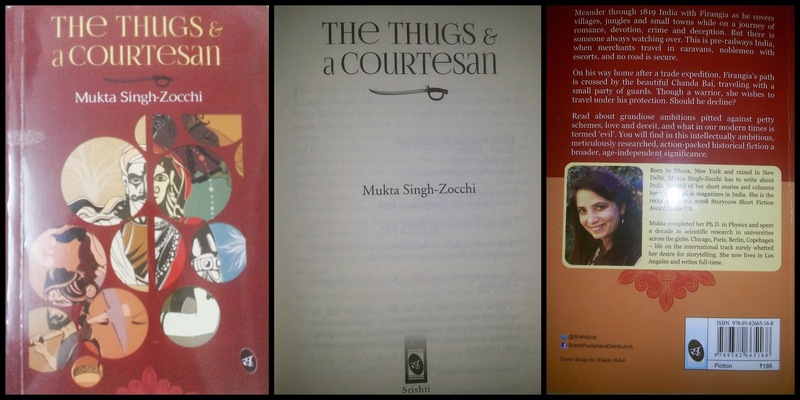 Born in Ithaca, New York and raised in New Delhi, Mukta Singh-Zocchi has to write about India. Several of her short stories and columns have appeared in magazines in India. She is the recipient of the 2008 Storycove Short Fiction Award in the US. Mukta completed her Ph.D. in Physics and spent a decade in scientific research in universities across the globe. Chicago, Paris, Berlin, Copenhagen – life on the international track surely whetted her desire for storytelling. She now lives in Los Angeles and writes full-time. The cover page is super-awesome and I give double-likes for it. It is creative and at the same suggestive. The title is equally interesting; simple and to the point. Book blurb is brief and gives an idea about what can be expected. The narrative crisp. The author delightfully transports us to a long-forgotten era. It almost seems like another world. She beautifully takes us through the muddy roads. She describes about kings and the mentality of the people vividly; it almost feels like watching a movie! Firnagia is the protagonist. He is someone who holds high values. His character is well-sketched. Also, his dilemmas are well-established. And I finding it tough to forget Zalim Singh. Chanda Bai is bold and charming. Writing a period book is never easy. Lots of research has to be put in. And I appreciate the author for taking that sweet pain and rendering a cute little book. The story unravels in a very slow pace. The first many pages concentrates on introducing characters and we feel lost in the midst of so many people. The book is too small considering the gravity of the plot. A few more pages would have made this book more interesting. And also an easy way to travel back to India in 19th century! Hearty thanks to ThinkWhyNot for giving away this book for review.